The Marcos Owners Club was formed in 1972 by Colin Feyeraband and since its creation has strived to support the marque and owners. It was originally know as the Marcos Club, but the name was changed in the 1980's to the Marcos Onwers Club. The aim of the club is to promote Marcos cars, old and new, regardless of model and provide an opportunity for owners to share ideas, seek answers to problems and enjoy owning their cars. The club organises events for the members as well as attending other events such as race meetings and car shows. These include the Silverstone Classic, Le Mans 24 Hrs, Classic Le Mans, Prescott Revival, the Classic Car Show, to name but a few. Special advisers have volunteered their time, expertise and knowledge to help you answer that difficult question or to offer help and ideas. The club also sources spares for members, offers acess to restoration and repair services, which otherwise might be difficult to locate. These service are growing all of the time. Remember, this is a club run by enthusiasts for the benefit of other enthusiasts, so we share a common interest. 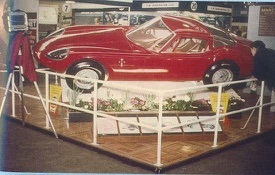 1964 - The Marcos GT 1800 is launched at the London Racing Car show as a road car. It has a Volvo 1800cc engine and De Dion sophisticated rear suspension.